If Donald Trump has one undisputable achievement during the first two years of his presidency, it’s that he has succeeded in increasing the political engagement of a large share of the American public. 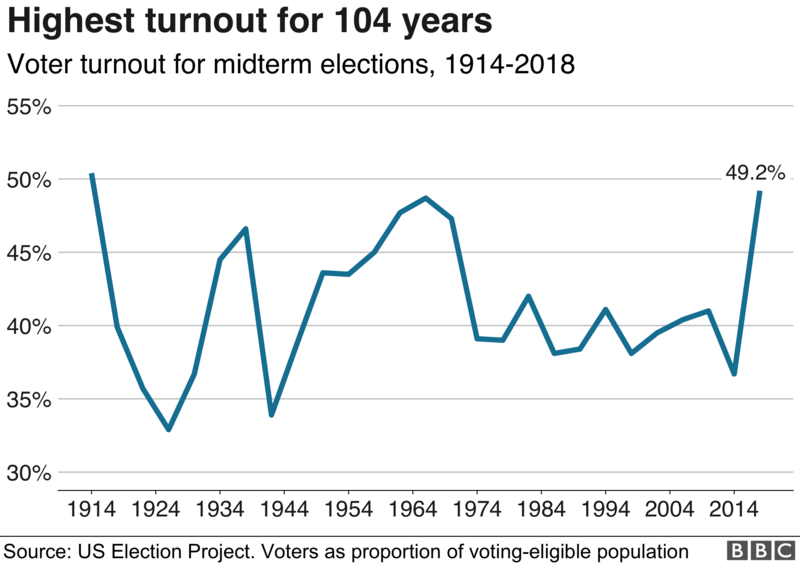 The last time turnout for a mid-term topped 50% was 1914 – before women had the vote in the US. In some states, the numbers were even higher. Washington and Colorado, which heavily utilise voting by mail, topped the list at 69.4% and 65.5%, respectively. Minnesota, always a high-participation state, came in at 64.3% this year. Even states with lower 2018 turnout saw sharp increases over recent mid-terms. In Texas enthusiasm generated by Democrat Beto O’Rourke (who was narrowly defeated) helped boost turnout to 46.1%, compared to 28.3% in 2014. Georgia, which had a contentious governor race, saw an increase from 38.6% to 55%. The numbers across the US still fall short of the roughly 60% voter participation seen during recent presidential elections, although 2018 does come close to the 51.7% mark for Bill Clinton’s 1996 re-election campaign. And digging back farther into the historical records, it surpasses the levels of the 1920 and 1924 presidential years. Overall, more than 103 million votes were cast across the US in races for the House of Representatives (in which all 435 seats were up for election). Some states, such as California, are still processing mail-in ballots, but at last count Democrats won 51.8% of the overall vote, while Republicans accounted for 46.5%. With seven races still to be decided, Democrats have posted a net gain of 35 seats, giving them control of the chamber for the first time since 2010. Thirty-three states also had Senate races, in which a total of at least 84 million votes were cast (a partisan breakdown of the balloting here is misleading because California, the largest state, had two Democrats advancing to the general election). And if there was any doubt that this election was a referendum on the Trump presidency, a just-released Pew Research Center poll should put them to bed. Only 35% of Americans said the president was not a factor in their mid-term vote. For those who had Mr Trump on their minds, 39% said they were casting their ballot against the president, while only 25% were voting to support him. According to Pew, 57% of Americans are “happy” about the results of the mid-term elections – although there are sharp partisan divides over exactly what they like about it. Ninety-one percent of Democrats are glad their party took control of the House, but only 11% are happy about Republicans holding the Senate. The numbers are reversed for Republicans, who are overwhelmingly pleased that their party kept the Senate, while only 20% are happy Democrats took the House. When it comes to the chance for real, bipartisan legislative progress in the next two years, the American public’s outlook grows darker. Sixty-three percent of poll respondents say Mr Trump won’t be successful in getting his programmes enacted, while 61% say the same thing about Democrats. Nearly half of all Americans think that relations between Republicans and Democrats will get worse, while only 9% see them getting better. And that may be the key takeaway from the 2018 mid-term elections. More Americans are engaged, more Americans are voting, but the partisan lines are deepening, and no one is all that convinced things are going to get better. Democrats and Republicans have two years to try to figure it all out before they face the voters again. And in 2020, Mr Trump won’t just be on voters’ minds, he’ll also be on the ballot.